It was a summer day in 2005. I sat on my apartment floor crying out to God. “Lord please, you’ve got to change me. I want to know that you satisfy. I want to know that you are enough even if I never marry. I want to say that I’m ok with that.” I was 23. I had just returned from a wedding weekend as a bridesmaid. I had been surrounded by couples. There was the couple getting married, the couple married for a year, the dating couple, my best friend who got engaged on the way to the wedding, and then there was me. Single without any prospects. At the time 23 and single seemed ancient. I smirk at myself just a little. Nonetheless, I was deeply struggling. I was the girl who had wanted nothing more than to get married. I knew it was an obsession, and I knew it had become my idolatry— the thing I had to have to make life work, the thing that without it I could not be happy. I dreamt of a home and a family, but instead I was alone and in grad school, a plan I’d never wanted. On my knees I pled for help. And God met me there and began to radically shape my understanding of His love. So clearly illumined was Jeremiah 31:3. I’ve since come to adore it in several translations. 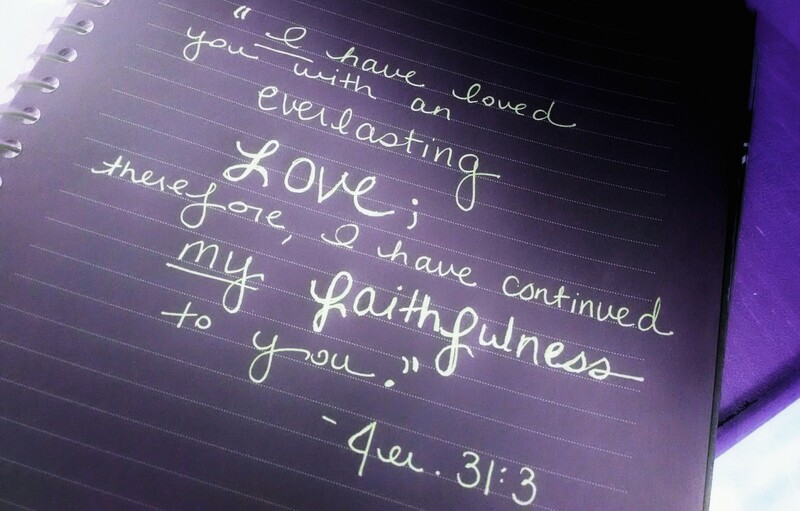 As I considered the verse, I journaled “Everlasting love. Always without end and without fail. You’ve drawn me, Lord? But still love seems so stoic.” I pulled out the giant Strong’s Concordance (no online tools in those days), and looked up the Hebrew word for love. I was astonished. This is how you love me God? This is how you view me? “Ami you want a man to love you this way, but this is how I love you.” No, the words weren’t audible, but with clarity the Spirit made His word alive. The catalyst sparked and grew into enormous flame. God’s loved for me was not business-like. It was not without emotion. He desired me to be with Him. He delighted in me. His love was vehement. It was fervent, fierce, powerful, intense, earnest, zealous, enthusiastic, and passionate! I had been a believer for 9 years. I knew Jesus had died for me, and knew He was my Savior. But I never really comprehended the true manifestation of His love. I was trapped in an “earning favor with God” mentality. I knew I couldn’t earn salvation, but I thought that by reading my Bible, serving at church, and all the rest, God was somehow more pleased with me. I thought that in my failures He was less delighted with me. I thought His love was stoic. I had never known the emotion my Lord has for me. I didn’t understand that on my worst days, He loved me no less, and on my best days no more. For, He already gave me the full measure of His love. I didn’t understand that His sacrificial love was inherently mingled with delight. So God began to teach me He was enough. Over the next several years He taught me to treasure Him more than marriage. I never reached the illusive “magic state of complete contentment in which God can now bring the one,” but I did learn to love what God was doing right then. I did learn that I was not waiting for life to begin. Who knew I had quite a few years of singleness left and a broken engagement before I would marry my beloved? Who knew I would experience a different type of singleness, called widowhood? Who knew that words like Ms, move on, and single adult would cause stinging pain when I thought I’d never hear them again? This is the love that truly satisfies. This is the way my husband could not fully love me. His love for me was great, but nevertheless imperfect. This is the love that is more than enough, even in widowhood, a plan I never wanted. This is God’s love for His people. With unfailing love Jesus sought me. With unfailing love He bought me. < Previous Good Shepherd may I sing your praise. Next > When sorrow hits: Getting the truth in. So well said, Amy. I am so blessed reading your passionate honesty. You “get” the gospel in such a real and personal way – you get what it is to live in the reality of God and His love. Thanks for teaching me! I’ve been there too – trying to earn God’s favor and I needed to read that tonight and be reminded! Thanks Shannon! I really appreciate you stopping by to encourage. I’m so thankful to be able to share all that God is teaching me through this journey. I had forgotten how much I loved to write. It’s also a blessing to see how God is using you and your husband on the mission field. I wish I had half your faith! But I’m thankful to say I know you and have known you for decades (way back from Jacobs 🙂 ) and you have always been a special girl and woman of God! Double amen! You reminded of when that thought first hit me, too, that He wouldn’t love me any less no matter what I had done to disobey or displease Him and He couldn’t love me anymore than He already did, no matter what service or good deed I performed in His name. It was and still is an overwhelming thought that I cherish. And I know we still don’t really get it because we’re still on Earth, but boy when we see Him Face to face, I think His love as well as His glory will cause us to fall on our faces! Maybe for “years”! This is me! i am in tears as I write knowing that you get it, I too prayed so long and clung to God’s word to find my soul mate. He was taken from me almost two months ago (we were married 2 1/2 years), and I hate this “new singleness” it is the worst. Will you be at the conference in Dallas in February?